Punjab is estimated to lose Rs 800 to Rs 1,000 crore annually on account of the VAT reduction on fuel. 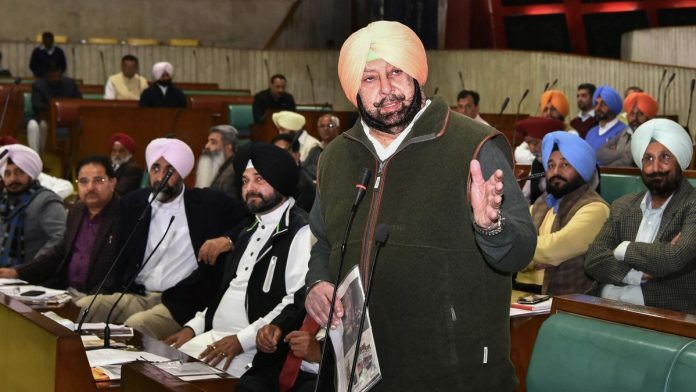 Chandigarh: Farm loan waivers, a steep cut in fuel prices, jobs: The Punjab budget announced Monday by the state’s Congress government was a please-all initiative with no new taxes. Among the notable initiatives was the Amarinder Singh government’s proposed ‘Make in Punjab’ scheme, which aims to boost local manufacturing and businesses on the lines of Narendra Modi’s ‘Make in India’. Presenting the budget to the assembly, Punjab Finance Minister Manpreet Singh Badal said the ‘Make in Punjab’ policy was still being drafted. According to the broad outline laid down in the budget, local suppliers will be given preference for 50 per cent of the goods sought under a public procurement order, “provided that their goods have a minimum local content of 40 per cent” and their bids fall within 15 per cent of the lowest bid. Punjab residents were in for big relief as the government slashed the value added tax (VAT) on fuel, paving the way for a Rs 5/litre drop in petrol prices from Monday midnight and a Re 1/L cut in the cost of diesel. The state is estimated to lose Rs 800 to Rs 1,000 crore annually on account of the VAT reduction, a senior official of the Punjab finance department told ThePrint. However, asked about the projected loss at the customary post-budget press conference, Badal said it would be offset by the ensuing increase in fuel consumption. Badal also announced an employment guarantee scheme, ‘Mera Kaam, Mera Maan’, which seeks to provide jobs to urban youths aged 18-35 years for a specific number of days each year. Another big announcement in the budget was the inclusion of landless farm labourers in the state’s flagship Farm Loan Waiver Scheme, for which the state government has allocated Rs 3,000 crore in fiscal 2019-20. Families of farmers who committed suicide have also been brought under the scheme, which thus far aimed to waive loans of up to Rs 2 lakh taken by small and marginal farmers with land holdings of two hectares and lower. “So far, 5.83 lakh marginal and small farmers have been provided relief worth Rs 4,736 crore,” the budget states. Other significant initiatives include a compensation of Rs 10,000 per acre for farmers of six border districts (Amritsar, Fazilka, Ferozepur, Tarn Taran, Gurdaspur and Pathankot) whose land is located between the border fence and the international border. A sports complex at Jalandhar, an open university at Patiala, and old-age homes at Barnala and Mansa were among the other offerings. The total outlay of the budget is Rs 1.58 lakh crore, with the outstanding debt of the state projected at Rs 2.3 lakh crore.